Google has removed the 'View image' button from Image Search in an attempt to make it harder for people to download copyrighted images. You can still click 'Visit page' to see the picture in its original context on a webpage, but if you've searched for a specific image, having to scroll through a whole page to find it is a real nuisance. The change is part of a deal with Getty Images, which filed a complaint against Google in 2016, accusing it of "creating captivating galleries of high-resolution, copyrighted content" ripe for pilfering. Thankfully there's an easy way to restore the button, and if you're looking for pictures, remember that Google's not the only game in town. Want to stick with Google? 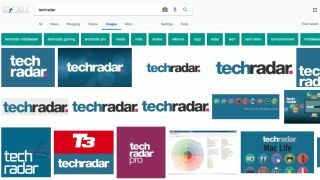 This snappily named browser extension for Firefox and Chrome does exactly what its name suggests: it reinstates the search engine's View Image and Search by Image buttons. There's no configuration necessary, and the only customizable option is whether to open images in a new tab. If you're technically minded, you can find the source code on Github. It might not always feel like it, but Google isn't the only search engine in town. DuckDuckGo is one of its most popular rivals, mostly because it doesn't harvest your data for advertising. There isn't a separate 'Images' tab on DuckDuckGo's homepage, but search for a term and you'll see the option at the top of the results. Interestingly, DuckDuckGo offers a 'View file' link that does the same thing as 'View image', but no 'View page'. Want to look for images on a specific site? DuckDuckGo supports a feature called Bangs, which lets you specify a source. For example, !flickr looks for pictures on Flickr, while !unspla finds photos on free stock image site Unsplash. These take you straight to results on the site itself. In case you're wondering, yes, there is a Bang for Getty Images (!gettyimages). Yes, Bing can be annoying. It's the default in Edge and Internet Explorer, it lurks in Windows 10's search bar, and it's the source for all those pretty lockscreen photos (the ones that open in Edge if you accidentally click in the wrong place). That can all be mighty off-putting, but if you need a picture, Bing Images is actually a great resource. Want to save and compare several pics? Hover your mouse over a thumbnail in its search results and click 'Save image' to add it to a temporary dashboard for easy access later. Click a thumbnail and you can not only view the image by itself, you can also add it to Pinterest, clip it to OneNote, and play a little slideshow of similar pictures. Like Google, Bing also shows you a list of keywords for that picture, which is handy for adjusting your search if it hasn't turned up exactly the results you're looking for.